A couple of years ago I discovered I could find better songs watching television than I could listening to the radio. Songs I would never have come across otherwise are now in power rotation in the car and on the iPod. 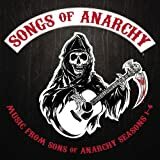 Songs like “Satan Your Kingdom Must Come Down” by Robert Plant and Band of Joy from the ill-fated, but incredible Starz drama Boss, the gruff “This Life” and the poignant “John the Revelator” from the excellent Sons of Anarchy, performed by 90s “Sunny 99.1” artist Curtis Stigers and the Forest Rangers. SOA also introduced me to other gems such as “Alesund” by Sun Kil Moon, “Our Last Flight” by Scala & Kolacny Brothers, the incredible “Mary” by Patty Griffin, “This Charming Life” by Joan Armatrading, “Into Thy Hands” by The Celtic Rangers Family Singers, “Big Fella” by Black 47 and “Dad’s Gonna Kill Me” by the incomparable Richard Thompson. Before it went off the air, One Tree Hill, contributed “The Sun” by the Naked and the Famous and “Secret Crowds” by Angels and Airwaves. The great Friday Night Lights left us with “Skull and Bones” by A.A. Bondy and “When the Night Comes” by Dan Auerbach among many others. NBC’s Parenthood is a great resource for new music. The Lennings do an outstanding cover of “You’re the One that I Want” from Grease. James Blake covers the Joni Mitchell tune “A Case of You,” and thank you for Donovan’s excellent “Catch the Wind.” The canceled Damages contributed Greg Laswell’s great solo piano version of “Girls Just Wanna Have Fun,” while HBO’s Big Love introduced me to “Home” by Engineers. Who says watching too much TV is a bad thing? Today is a day where we here in the United States celebrate our freedom, eat hot dogs and watch fireworks. Just for you, here is a great summer tune from one of America’s greatest treasures, Bruce Springsteen and the E Street Band. It’s one of the last songs the band ever played with original member, “Phantom” Danny Federici. Have a safe holiday! My wife and I get 48 hours a year to be together all by ourselves and we usually spend that time around our anniversary in the great city of New Orleans. Our nightly trek usually starts at the legendary Pat O’Brien’s. We enter off of Bourbon St., walk through the crowd, get a blast of hot air from the big fire pit in the middle, and then make our way to the back and order a hurricane (a drink so powerful you only need one). We then stand around for a few minutes and people watch, and when we are ready to leave, we walk out the back past the long line of people waiting to get into to see the Preservation Hall Jazz Band in the infamous Preservation Hall. Preservation Hall was founded in 1961 by Allan and Sandra Jaffe as a way to preserve New Orleans Jazz. The building in the French Quarter was once a tavern in the War of 1812 and to this day has never received a “facelift.” Even though it has no air conditioning or any other modern day luxury, it’s packed every night by people eager to bop along to music played by some of the finest musicians in the Crescent City. In the band’s illustrious 50-year history, it has never recorded an album of all original material…until now. That’s It, produced by Jim James of My Morning Jacket and director Ben Jaffe (son of the Hall’s founders) was recorded in the famed venue and is quite a delight. Drummer Joe Lastie kicks the album into high gear on the album’s first track “That’s It,” which also features stellar tuba work by Jaffe and a very creative trumpet solo by Mark Braud. “Dear Lord (Give Me Strength) is pure New Orleans dance music with a great gospel vocal. “Sugar Plum” almost sounds like it could have a rap over it like many of the songs on HBO’s Treme’ soundtrack. “Rattlin’ Bones” has a Dr. John vibe, “I Think I Love You” and “Come With Me,” both sung by the legendary Charlie Gabriel, are as cool as the other side of the pillow, and the sultry “August Nights” is one of those ballads that would have been cool to here Frank Sinatra belt out with the band. I will have to admit I am not a jazz connoisseur by any stretch of the imagination, but I really love the stuff that comes out of that little old building at 726 St. Peters. This new album, which comes out on Tuesday, is a fun, spirited collection of originals that will have you dancing and wanting to lift up your shirt for some beads. Okay, maybe that last part is just wishful thinking.